Auto Meter Z-Series Gauges are versatile, durable and dependable, providing quick and accurate readings with race-proven core instruments. Z-Series gauges deliver race-inspired looks with easy-to-read white-on-black dials, bold pointers and traditional incandescent lighting around the perimeter. 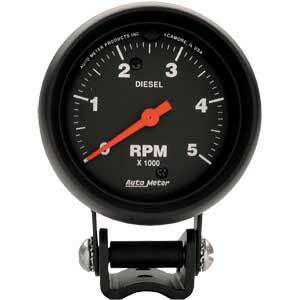 These gauges are well-suited for any street or race vehicle and are 12 and 16-volt compatible. Available in most popular sizes and application readings in mechanical or electrical. 2888 is rated 4.0 out of 5 by 2. Rated 3 out of 5 by Rjenkins22 from Not impressed so far Bought this for my squarebody chummins. First of all they recommend using a inline fuse which for some reason they dont supply nor do they tell you is even needed before you go to install it. Second the clamp came zip tied like a pretzel. No amount of manipulation will allow this thing to work at this point. I ended up just using zip ties to hold the probe on the alternator. For the price I could have gone with the Isspro setup that uses the balancer.. I have a Chinese farm tractor with 3 cylinder diesel engine will this work for it? According to Autometer, this should work for your application as long as the engine has an alternator.